We’ve been hard at work making improvements to our expenses features based on your feedback: this week we released a hugely improved Expenses area of Craftybase that allows you to log multiple purchases from the same vendor in the same screen. Much like the way our newly improved Orders area works, you can now create a single Expense record and instantly assign as many different expenses to it as you like. All expense categories can be added to Craftybase in this way - postage, material purchases, travel, tools & equipment and more. 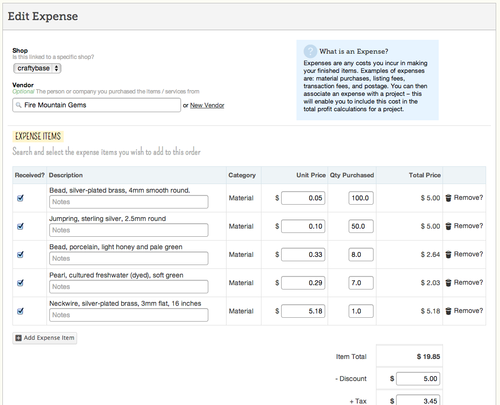 Based on the expense category you select, you can link each expense with a project, order or material from the one screen. Shipping, discounts and tax can also now be assigned to an Expense, and Craftybase will automatically proportion these amounts to each item in your expense for use in your manufacture and project cost tallies. Take our new Feature Tour!